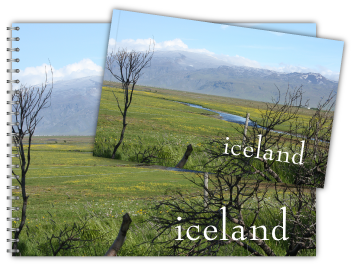 Following up on last week’s blog post about using the new Book Module in Adobe Lightroom 4 to create Square MagCloud publications, today we are looking at an easy way you can use Adobe Photoshop to create a vacation photobook with MagCloud’s landscape-oriented Standard and Digest products. We’ve also added new Software-Specific Instruction Packets for Photoshop to our Getting Started page for all of our product sizes. These downloadable folders contain MagCloud-specific templates and instructions for Photoshop CS4 and newer, as well as step-by-step instructions to help you create your publication from scratch using any version of Photoshop. To get started with your photobook, the first thing you need are photos. For the photobook we’ll be creating today, all the images will be full-bleed and extend to the edge of the landscape-oriented pages. 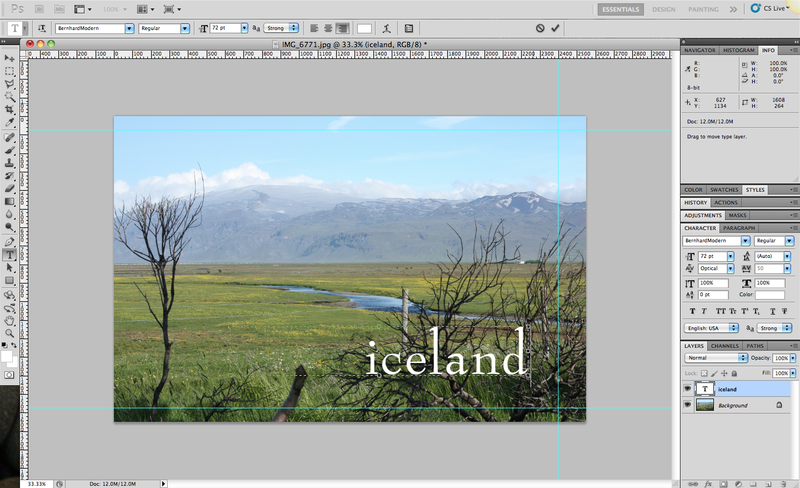 As a result, landscape-oriented images will work best for this type of book. If you wanted to use both portrait and landscape-oriented photos, then one of our Square products might be a better fit. You can find instructions for using Photoshop to create an 8″ x 8″ or 12″ x 12″ Square publication on the Getting Started page on the MagCloud website. In addition to the orientation of your photos, the resolution is also important. We recommend using images that are 300 pixels per inch. Therefore, if you want to create a small Digest size photobook, you should use images that are at least 2550 pixels wide by 1650 pixels tall, or roughly the largest image size available from a 4 megapixel digital camera. If you want to create a larger Standard size photobook, your images will need to be higher resolution – at least 3300 pixels wide by 2550 pixels tall, or roughly the largest image size available from an 8 megapixel digital camera. If you are using high quality images from at least an 8 megapixel digital camera then your images should be fine for either size, however you can check the manual for your camera to be sure, or check the dimensions of your images in the file information on your computer. To create each page in your photobook, including the front and back covers, open the image you want to use in Photoshop and go to Image > Image Size. 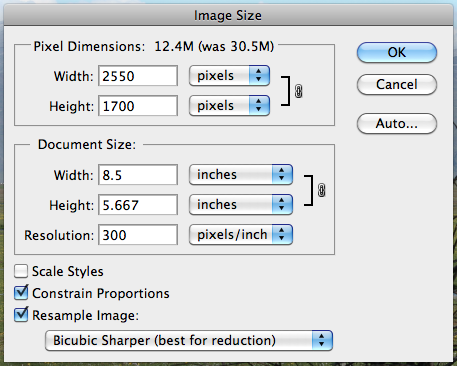 Make sure that the boxes are checked next to “Constrain Proportions” and “Resample Image”, select “Bicubic Sharper” from the dropdown menu, and set the Resolution to 300 pixels/inch. If you are creating a Digest size publication, set the width to 8.5 inches. If this causes the height to drop to less than 5.5 inches, then set the height to be 5.5 inches. Note that this will cause the width to be greater than 8.5 inches, but the image will be cropped to compensate for this in the next step. 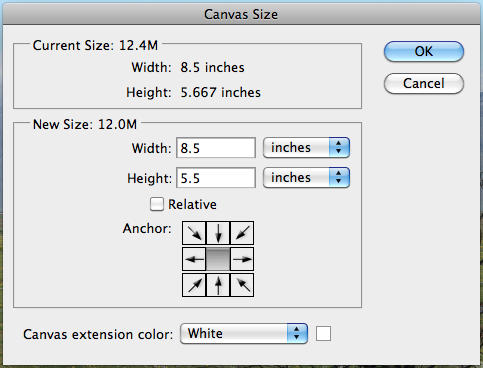 Similarly, if you are creating a Standard size publication, set the width to 11 inches. If doing so causes the height to drop to less than 8.5 inches, then set the height to 8.5 inches and allow the width to go above 11 inches. When you are finished, click OK.
Next, go to Image > Canvas Size. Select “inches” from the dropdown menu, if it’s not selected already. If you are creating a Digest size publication, set the Width to 8.5 inches and the Height to 5.5 inches. If you are creating a Standard size publication, set the Width to 11 inches and the Height to 8.5 inches. Click OK, and when you are warned that some clipping will occur, click the button to Proceed. If you would like to add any text over your full-page image, like a title on the cover page, you can do so now using the text tool. Keep in mind that Digest publications will have 0.125″ trimmed off the top and bottom edges, and 0.25″ trimmed off the outside edge (the right, in the case of the cover), and since the trim can vary slightly in either direction, it’s best to keep any text at least 0.25″ inside of this trim line. Similarly, landscape-oriented Standard publications are trimmed 0.125″ on all sides, and also have holes punched on the inside edge for the Wire-O binding (the left, in the case of the cover). Therefore, if you are creating a Standard size photobook, it’s a good idea to keep text 0.25″ inside the trim line on the top, bottom and outside edge and 0.5″ inside the trim line on the inside edge for this size of publication. If you will be adding a lot of content, it may be helpful to add guides to remind yourself where the trim will occur. When you are happy with the look of your page, go to File > Save As. Select “JPEG” from the Format dropdown menu and make sure that the box next to “Embed Color Profile” is checked. Your color profile may be something other than the sRGB profile shown in the screenshot at right, but embedding your color profile will help ensure that our Indigo presses are able to reproduce your images with the best color possible no matter what color profile they use. Select a name for your file and choose where you want it to be saved on your computer, then click Save. I recommend saving all your page files to a new folder and naming your files numerically, with the cover as Page001.jpg, the inside front cover Page002.jpg, and so on, as this will make it easier to create your final PDF. 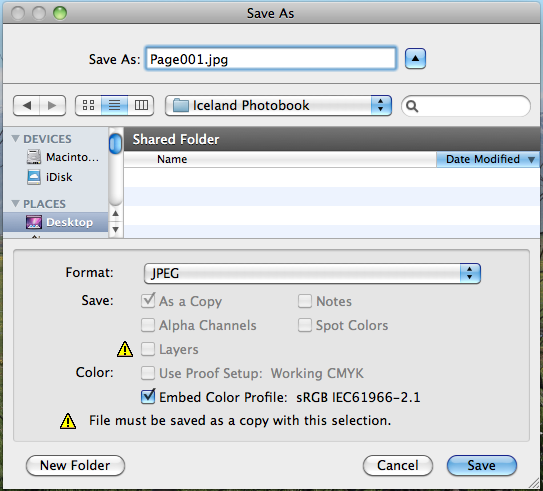 In the JPEG Options window that appears next, select “Maximum” from the Quality dropdown menu and select the radio button next to “Baseline (Standard)” under Format Options, then click OK.
Repeat these steps for each of the pages in your photobook, resizing and cropping one image for each page. If you want to include pages in your book that don’t include an image, as I did on the inside front and back covers in my publications, take a look at the templates and instructions in the downloadable Instruction Packets on the our Getting Started page. These instructions and templates start with a blank document in Photoshop, rather than modifying an existing image file. Once you’ve created all of the pages for your photobook, it’s time to combine these pages into a single multipage PDF using Adobe Acrobat Pro. 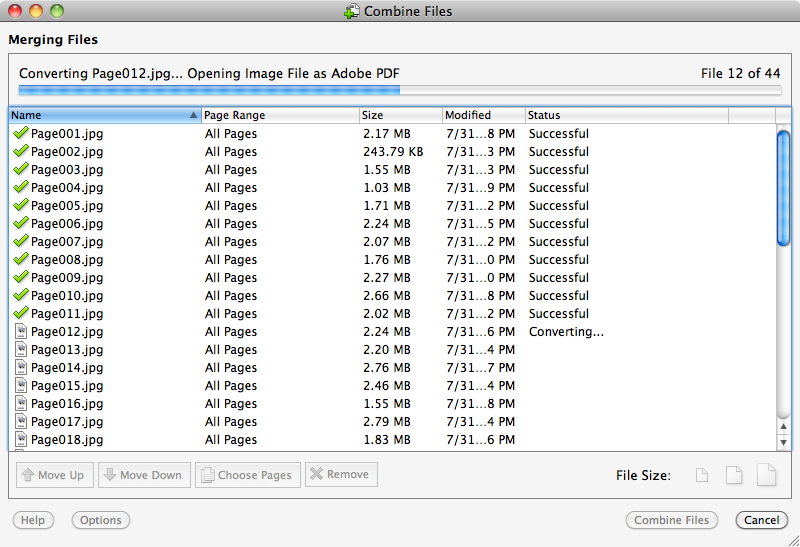 Open Acrobat and go to File > Create File > Merge Files into a Single PDF. Click the button to Add Files and select all the page JPEGs you just created. Sort the files alphabetically by name to put the pages in numerical order, or use the Move Up/Move Down buttons to rearrange the order of the files. When you are happy with the order, select the largest file icon on the far right where it says File Size and click Combine Files. When prompted, choose a name for your final PDF and click Save. Your PDF is now ready to upload to MagCloud! If you don’t have Adobe Acrobat Pro, an alternative method is to use Adobe’s subscription-based CreatePDF service either online or within Adobe Reader to convert your JPEG files to PDFs and combine them. The other option is to save your pages as PDF files out of Photoshop instead of JPEGs, and then combine these single page PDFs into one multipage PDF using a PDF viewer like Apple’s Preview. You can find instructions to do this in the Instruction Packets on the Getting Started page. The downside to this method is that it will result in a PDF that is much larger than the method using JPEG files, and you may be in danger of going over MagCloud’s 300MB file upload limit. Vacationing this summer? Whether you’re flying internationally or driving just a few hours away, we want to help make every moment of your trip a little more memorable. As promised in our Summer Fun with MagCloud blog post, we’ve got some great tricks and tips to help you capture your summer memories through photography. Try shooting closer to sundown: Not only will there be less people there, but the sun will be at an angle that produces great shadows and colors. Try black and white: This can completely change the mood and feel of a shot. It’s great for overcast or dull days, too. For more beach tips, check out this helpful blog post! Location, location, location: Picking a spot in the sun or the shade will make for a beautiful lighting situation! Useful props: Place wax paper or white shower curtain between the sun and your subjects. This will diffuse the light and soften the shadows. Check out even more ways to make your family picnic memorable by reading the full post from Olympus cameras here. Power up: Nothing is worse than wanting to snap that perfect picture, and realizing your battery is dead! Rule of thirds: When you are lining up that beautiful church, amazing sunset or one-of a kid safari shot keep in mind composition and the rule of thirds dividing your photo into thirds both vertically and horizontally with the key subject at the intersection point. Newer smartphones make this particularly easy to do with their Grid settings. Put your own spin on landmarks and well-known sites: Rather than take the usual straight on shot of the Eiffel Tower consider taking it from underneath looking straight up, take a lush jungle shot in the rain, or shoot the crowd below from the top of the Empire State Building. Don’t be afraid to take unique shots or see things as the locales do. Go for contrast and color: Boat sales against a blue sky, a garden of wildflowers, colorful mailboxes on a cobblestone street all make for interesting travel shots with pops of color. Here’s a few other tips to get you inspired. We’re curious about your best vacation photos – what are some tricks and tips you’ve learned along the way? Please share with us in the comments below! Summer is a great time for vacations and relaxation. It’s also the season for many music festivals and film festivals. For the behind-the-scene teams that organize these events, it’s hard work right up until that last note is played and the final credits are rolling. At MagCloud, we’re here to help make sure your event goes off without a hitch. We can make you confident that your printed programs, brochures and handouts are of the highest quality without breaking the bank. Get started and create a PDF file of your publication, easily upload it to http://www.magcloud.com, preview your work, then select your print options. It’s that easy! It costs $0.20 per page and note that all orders for 20 or more print copies receive a 25% discount off the productions costs. Plus you can make the same PDF available in digital format for festival goers who want to enjoy the program on their mobile device or computer. One of the perks of using MagCloud is that the connection you create with your audience doesn’t have to end at the event. We encourage you to publish a post-event roundup and share it out with festival goers via mail, email or your favorite social network. It’s taking that extra step that will bring people back next year, and it’ll be a fun, unique way to remember the festival long after the summer fades. Need more details on what the process actually entails? We’ve got you covered. Remember, if you ever run into trouble or just need to learn more, you can always visit our Ask MagCloud page or find us on our social media channels (Twitter, Facebook and LinkedIn). Wishing everyone a happy, fun-filled and rockin’ summer!